To quantify the fate of terrigeneous organic matter from soils to the ocean, with particular focus on estuaries and coastal waters. To quantify and understand the loss processes in estuarine environments. To build a new model of terrigeneous organic matter cycling valid in marine and fresh waters, and use it to predict the future evolution of the land ocean carbon flux. If unlocked, the organic carbon in soil could enter the atmosphere and contribute to climate change. However, the IPCC report states many of the key processes relevant to the movement of organic carbon from the land to the ocean are missing from models - the LOCATE project will address this by sampling a third of the rivers that drain the UK in order to better understand these processes, and integrate the findings into a new model. This model will help better predict the fate of one of the planet’s largest carbon pools. British soil carbon provides society with a range of benefits. On fields, soil carbon supports crop production, whereas peatlands act to stock-pile carbon away from the atmosphere where it can lead to climate change. Carbon reserves are threatened by land-use change in changes in climate leading to increased losses from land to rivers, estuaries and oceans. These losses have been reported across Britain and Europe and pose a variety of risks including degraded drinking water quality through and decreased fertility of soils as well as potentially adding to man-made emissions to the atmosphere. Soils across the globe contain about four times as much carbon as the fossil fuels, which to date have entered the atmosphere via combustion. This pool of carbon is greatest at high latitudes, such as Northern Scotland. Each year some of this carbon leaches into rivers and streams, gradually increasing the concentration in parts of Britain and Europe. If bacteria use this carbon to grow or sunlight destroys it, the carbon returns to the atmosphere. The rest is either buried or enters the open ocean. Scientists have yet to understand what controls these various processes or how they could change, with historical estimates showing substantial geographical differences. For this reason LOCATE will establish how much soil carbon is getting into rivers and estuaries and do some accurate up to date carbon accounts for the Great British landmass. In addition, LOCATE will develop natural observatory catchments in Scotland, Wales and England to examine the carbon cycle in detail. LOCATE partners will use the observation results to develop predictive models with which future policy and land management plans can be developed. 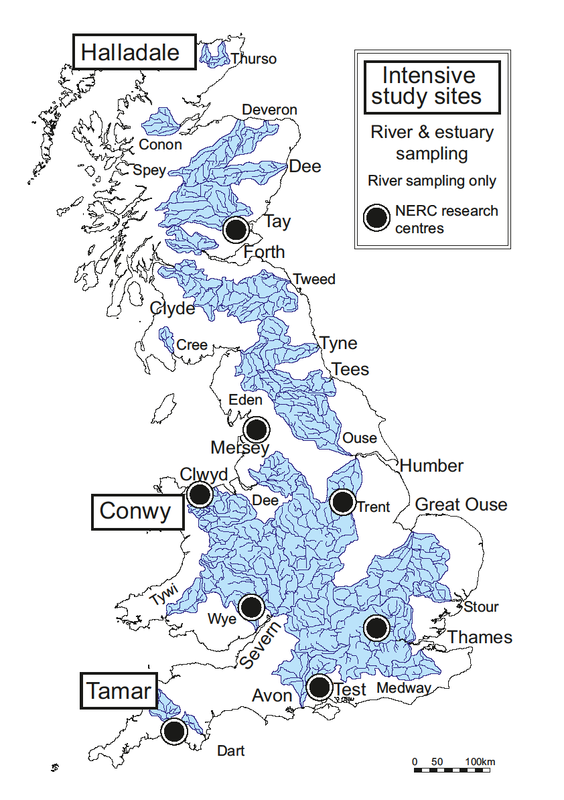 LOCATE uses the power of the highly distributed set of Centres NERC has across the nation to conduct an ambitious sampling programme.